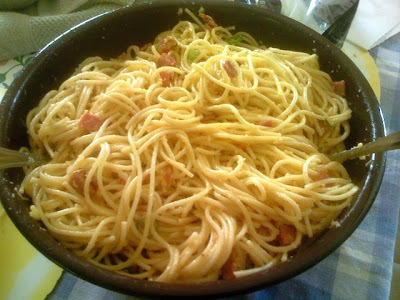 This Spaghetti Carbonara recipe is very easy to do. 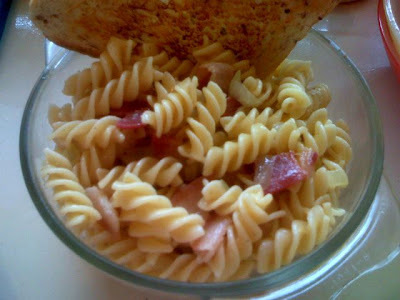 But even then, I had a problem with my first batch mainly because I used the pasta we had on hand, which was fusilli (or pasta twirls). I learned the hard way that fusilli will not work on this recipe because there is simply too much surface area per piece for the egg to cover, leaving the dish bland. Plus, reheating the pasta and adding more egg did not work too! Undaunted, I tried the recipe again this time with spaghetti and it was wonderful! A delicate taste of egg-coated spaghetti with a bit of saltiness and crunchy texture from the bacon mixed with the savoury taste of parmesan. This carbonara goes back to basics, and does not use cream. I find that this recipe is yummy by itself, as the cream does not overpower the egg, bacon and cheese combination. Fry the bacon in oil til crisp. A few minutes before you remove from the pan, move to one side then saute the garlic, followed by the onion, then mix in the bacon. This way you do not get overcooked garlic and onion. Cook the spaghetti noodles as per package direction. The next step is crucial. When the spaghetti is al dente, drain off the water and transfer to a bowl. Then while the pasta is still hot, quickly pour in the scrambled eggs and toss thoroughly. The heat from the pasta will cook the egg, and the salt and pepper from the egg will flavour the pasta. Next, add the bacon and toss. Taste the pasta. If it's a bit bland, you may season with salt and pepper. i remember mom making one but sometimes, she adds tuna.. instead of topping it w/ bacon. now kasi, i prefer red/ spicy sauce talaga.